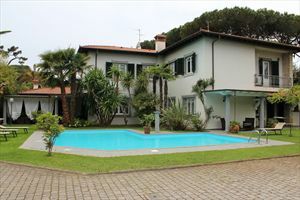 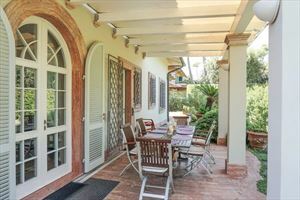 A modern light villa with a small garden located in the central part of ​​Forte dei Marmi at a distance of about 800 m from the sea and from the central square. 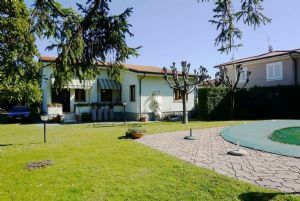 A modern light villa (200 sqm) with a small garden (450 sqm) located in the central part of Forte dei Marmi at a distance of about 800 meters away from the sea and from the city's central square. 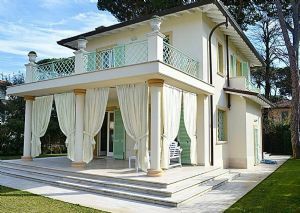 The house is equipped with air conditioning, alarm system, satellite TV, Internet Wi-FI, safe. 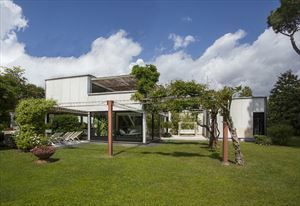 There is a parking and barbecue area in the garden. 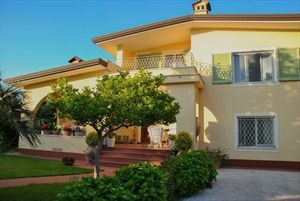 On the ground floor are 2 covered terraces with outdoor furniture and dining table, a living room with fireplace, a dining room, guest bathroom, a kitchen, 2 double bedrooms with private bathrooms and a laundry. 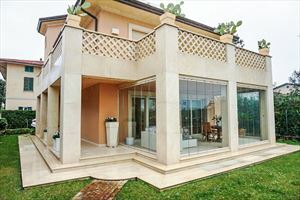 The top floor includes 1 bedroom with 2 single beds, 1 master bedroom with ensuite bathroom with bathtub and a terrace with spa bath and summer shower.